Peter O'Toole, Alec Guinness, Anthony Quinn, Jack Hawkins, Omar Sharif, Jose Ferrer, Anthony Quayle, Claude Rains, Arthur Kennedy, I.S. Johar, Stuart Saunders, John Dimech, Norman Rossington, Jack Gwyllim, Michel Ray, Fernando Sancho, Hugh Miller, Henry Oscar, Howard Marion-Crawford, John Ruddock, Zia Mohyeddin, Kenneth Fortescue, Gamil Ratib, Donald Wolfit. Freddie Young (Fotografía), Robert Bolt, T.E. 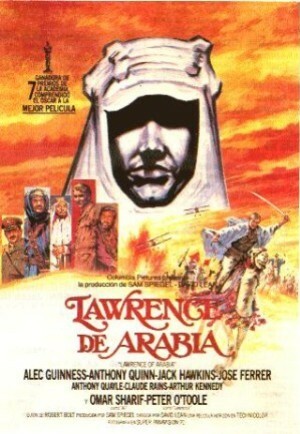 Lawrence, Michael Wilson (Guión), Maurice Jarre (Música).